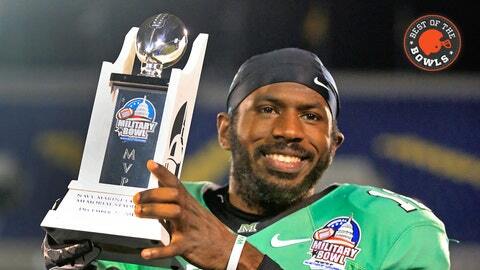 Marshall QB Rakeem Cato shined in the Military Bowl, earning the game's MVP award. Rakeem Cato to Gator Hoskins for the Military Bowl win. Read that again, breathing in all those fumes of glory. It came from Shane Alexander’s brilliance. You can’t tell me it’s not fun to say, “Rakeem Cato to Gator Hoskins for the Military Bowl win.” You can’t. I just screamed it from my roof. Cato is everything that’s great about these nondescript bowl games that as many people mock as watch. He went 28 of 44 for 337 yards and three touchdowns (no picks) as Marshall beat Maryland 31-20 in the Military Bowl, giving us fun afternoon football a few days before most fans start tuning in for their bowl fix. While earning the bowl’s MVP, he helped get Marshall its 10th win of the season and second bowl victory in three seasons. What, you’re not impressed? Fine, fine. God it really takes a toll out of you to be a Maryland fan. University of Maryland athletic programs are (part of) the reason I drink. Wait, that last one isn’t a depressed Maryland fan. No, that’s a Big Ten fan backing as far away from the Terps until he has to accept his “problem” into the league next season. Meanwhile, social media is currently filled with ACC types hollering “good riddance!” – and other forms of sweet goodbyes – Maryland’s way, because after 61 seasons in the league, the relationship has come to an end. Beginning in 2014, Maryland will compete with more established and formidable football programs in the Big Ten. For all the talk about the B1G’s bruises in 2013, that’s a step in a tough direction for a program that won 10 or more games only six times in the six decades it belonged to the Atlantic Coast Conference. That’s not even a daunting slate compared to what those in the Pac-12, SEC or Big 12 will face, but it’s hard to find six wins on there, which means Maryland might not have the opportunity to even return to the Military Bowl next season. And what that means is athletic director Kevin Anderson will face the awkward situation of having fired his last coach, Ralph Friedgen, after he went 9-4 in 2010 with a win in the bowl game Edsall just lost. Perhaps 10 Friedgen seasons were too many in College Park, but he led Maryland’s most successful stretch in the ACC. Three of those six double-digit win seasons in 61 years belong to Friedgen (2001-03, his first three seasons at the school), as does a 5-2 bowl record. Yes, 5-6, 5-6 and 2-10 also bear his name, but if Anderson is using the Friedgen era as a floor, well, Edsall already has two seasons as poor as Friedgen’s three worst. The Terps also dealt with an unreal string of injuries, including to top receivers Stefon Diggs and Deon Young. But as Edsall gets crushed by local columnists, here he is at 2-10, 4-8 and now 7-6 in his first three seasons at Maryland. You know how these things go: There’s a three-year building period for most coaches, and then boosters and alumni become cranky in Year 4. Rakeem Cato probably pushed Edsall a little harder into that a fourth year, into a new league in which life will be more difficult and Maryland was recruited for its television market (Washington, D.C.) first and its football pedigree somewhere close to last. Meanwhile, Cato has another season to play for the Thundering Herd, in which he’ll take aim at school passing records owned by Chad Pennington. He needs almost 3,000 yards to surpass Pennington’s 13,143 career passing yards (Cato threw for 3,916 this season) and 28 passing touchdowns to break Pennington’s record of 115. We’ll get to watch Cato tear up Conference USA once more, which will be a blessing. The only sad part in all of this? Gator Hoskins is a senior. So you know what we have to do once more. RAKEEM CATO TO GATOR HOSKINS FOR THE MILITARY BOWL WIN!